Like General Motors and Fiat Chrysler, Ford Motor Company has continually failed to convince Wall Street analysts and investors of the worthiness of its stock price over the last few years. Tonight, reports indicate that situation may have cost Ford CEO Mark Fields his job at the automaker. Forbes reports that Fields, who had been CEO of Ford since 2014, is about to be out amid a big management shakeup tied to board concerns over the company’s overall strategy and its stock price. We reached out to Ford for comment but have not heard back yet; this report is yet unconfirmed, but Forbes said the announcement is expected to come Monday morning. The shakeup is a result of Executive Chairman Bill Ford and the rest of the board losing confidence in Fields’ leadership, according to people familiar with the board’s thinking. Fields replaced Alan Mulally in mid-2014, but lacked his predecessor’s ability to rally employees around a common mission or to make critical decisions about the company’s strategy. The Wall Street Journal also reported “significant changes to the auto maker’s senior leadership team,” but the story does not note the firing of Fields. 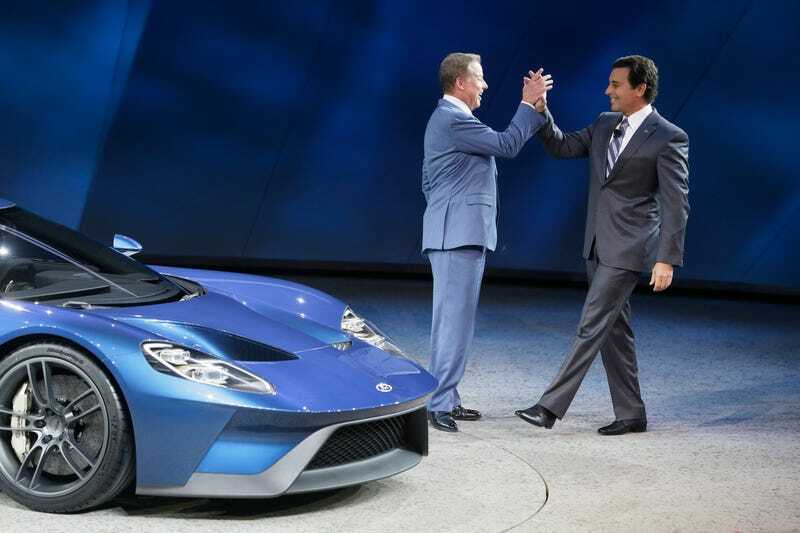 Forbes says that James P. Hackett, the head of Ford’s Smart Mobility LLC subsidiary, will take Fields’ place. Under Fields, Ford underwent a shift toward becoming a “mobility” company focused on apps, ride-sharing and autonomous vehicles, to say nothing of big headline-making products like the new Ford GT. At the same time, that mobility strategy has often felt haphazard and ineffective; it’s safe to say FordPass hasn’t exactly transformed the way we get around. And Ford has suffered from the same problems that its traditional American automaker contemporaries faced: namely, convincing Wall Street that its stock price was worth a damn and that it could effectively weather another recession, economic crisis or a spike in gasoline prices. (Indeed, these days Tesla is more valuable than GM is.) And in an effort to cut costs and invest in technology, Ford recently announced a layoff of some 1,400 people. As Forbes and the Journal note, Ford’s stock price plummeted nearly 40 percent under Fields’ tenure. If this report is true, it is not hard to see why the board had simply had enough. More on this as we get it tomorrow, but if it is true, it is probably the starkest example yet of how traditional automakers are facing existential challenges in this new era of “mobility” and technological disruption. Ford Motor Company today named Jim Hackett as its new president and CEO and announced key global leadership changes designed to further strengthen its core automotive business and accelerate a strategic shift to capitalize on emerging opportunities.